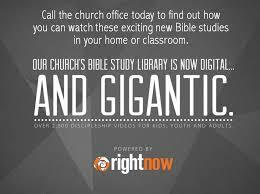 First Baptist Church offers two libraries for your use — the physical library/media center located in the church and a virtual library. Our media center is conveniently across from the elevator behind the 3rd Floor Fellowship Hall. Find the latest newsletter on the Publications page under Resources. Hours: Sundays 8 –11:30 a.m. and Wednesdays 1 – 7 p.m. The library carries media for all ages — books, magazines, videos, CDs and DVDs. Video and audio recordings of sermons and services are also available for checkout and you’ll find curriculum for Bible Teaching classes. Special assistance for children is available each Wednesday from 5:15 – 5:45 p.m.
First Baptist also has access to RightNow Media, an online library subscription provided by our church and accessible to every member. It’s easy! Go to our FBCJC access page. Your first time you’ll need to set up a profile and share your interests. Then, when you login you will be able to experience over 15,000 Bible studies, 2,000 kids videos, conferences, leadership training and more, content that comes from over 250 top Christian publishers and ministries on topics ranging from marriage to parenting to finance to discipleship to missions. These are available for you to view from your phone, tablet, computer or TV. Use them individually, as a family or for leading small groups. View our FBCJC access page start learning, growing and enjoying today!